New perspectives can really open up subjects that we think we know pretty well. In 2011, the low-budget Mexican drama MISS BALA explored the dangerous Mexican drug business through the eyes of an innocent, would-be pageant contestant, Laura Guerrero. An unforgiving storyline and powerful characters made it a critical favorite. Now, director Catherine Hardwicke brings a new version of MISS BALA to the big screen on February 1. 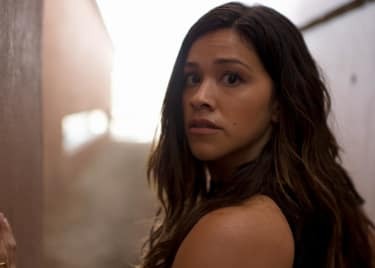 Gina Rodriguez stars as a Mexican-American woman kidnapped by a drug cartel after traveling to Tijuana, Mexico, to visit a friend. Trapped, she agrees to become a money smuggler for the cartel. Part of the new perspective in MISS BALA is a more action-oriented approach than the original film. This isn’t a typical action film, however. There’s more going on here that makes this a unique action movie. Representation has been a big issue in Hollywood for a long time, and things are finally changing. Audiences and filmmakers alike have pushed for more inclusion in entertainment. The story of MISS BALA is deeply bound to Mexican culture, and the film shines the spotlight on Latin American talent. The cast is mainly comprised of Latinx actors, such as Gina Rodriguez, Ismael Cruz Córdova and Aislinn Derbez. MISS BALA also has a predominantly Latinx crew behind the camera. The script is by Gareth Dunnet-Alcocer, a Mexican writer who penned the critically acclaimed 2014 film CONTRAPELO, as well as the upcoming SCARFACE reboot. Approximately 95 percent of the cast and crew was reported to be Latinx. We don’t see percentages like that often, even on movies inspired by Latin American or Mexican culture. Action films directed by women are also scarce. There’s been a slight shift in the industry thanks to projects like Patty Jenkins’ WONDER WOMAN, but a lot of work remains to be done. MISS BALA aims a strike at Hollywood’s glass ceiling. The director is Catherine Hardwicke, who started in film as a production designer before shifting to directing with THIRTEEN in 2003. In 2009, Hardwicke jumped into the mainstream with TWILIGHT. But long before her professional career began, she was hopping back and forth across the border between Texas and Mexico. Hardwicke grew up in McAllen, along the border near the very southern tip of Texas. That gives her a rare perspective to apply to MISS BALA. MISS BALA isn’t a typical action film. It promises to be a great experience, with big spectacle and powerful characters. Despite the film’s origin as a remake, the makeup of the cast and crew helps bring the story to the screen in a way we rarely get to see — this is a unique film in more ways than one. Look for MISS BALA at AMC beginning February 1.